One of the NHL's most controversial players is already up to some old tricks, even before the official start of the new season. Washington Capitals forward Tom Wilson delivered an ugly, high hit to St. Louis Blues forward Oskar Sundqvist during the Capitals' final preseason game Sunday. About five minutes into the second period, Wilson crushed Sundqvist in open ice and was given a match penalty as a result. Sundqvist sustained upper body injuries as a result of Wilson's hit and, according to St. Louis coach Mike Yeo, he could miss a good amount time. Blues coach Mike Yeo said Oskar Sundqvist is "not good" after being injured on hit from Tom Wilson. Hasn't seen team doctor yet, so no official diagnosis, but Yeo said he has "a couple of upper-body injuries" and expects him to be out a while. Wilson could also miss some time as a result of the hit, depending on how the league's Department of Player Safety decides to handle the incident. Wilson is a repeat offender who is regarded by many as one of the league's dirtiest players, so that -- combined with the fact that Sundqvist was hurt on the play -- might not help Wilson when it comes to supplemental discipline. The league's Department of Player Safety announced Sunday night that Wilson was offered an in-person hearing, meaning that he'll be eligible for a suspension that exceeds five games. We've seen multiple suspensions in the NHL already this preseason, and this seems likely to become the third. 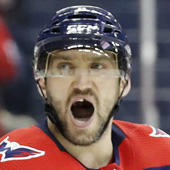 Unfortunately for Wilson, the Caps have no preseason games remaining, meaning any possible suspension coming down from the league would take effect during the regular season. Wilson often plays on the edge and is no stranger to the league's disciplinary department. He was banned three times last season alone, missing four preseason games, two regular season games, and three playoff games due to suspension.